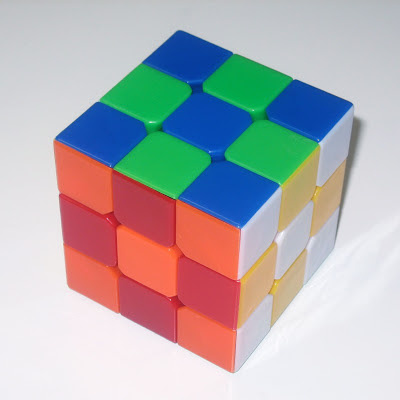 There are a lot of hacks of Rubik's style puzzle cubes out there. Many of them require modifications of the shapes of the pieces themselves, like Tony Fisher's "Fisher's Cube", which rotates one plane of the cube by 45 degrees. It makes it very confusing to solve. Similarly is the "Windmill Cube" which also rotates one plane. Others slice away at portions of the cube to produce a dodecahedron. (Many of these can be found on TwistyPuzzles.com). Another modification of twisty puzzles involves restickering a puzzle cube to do things like maze puzzles, color-sudoku, and such. I decided to do a take on this. I had a "stickerless" DaYan 2 Guhong "speed cube" that I had bought to see what this design of cube felt like. I'm by no means a speed cuber, but I figured I'd check it out. I decided that this cube would be a platform for trying a few different puzzle mods. Being "stickerless", this meant that each piece's plastic is actually the cube's color (red, orange, blue, green, yellow, white) rather than having stickers applied to a black plastic cube. I kinda like the look of the stickerless cubes. The first one I did was to shuffle up the cube, and put stickers (in this case, vinyl electrical tape diamonds) on it to look like pips on a die. In its solved state, it looked like a multicolored die, 6 opposite 1, 3 opposite 4 and 5 opposite 2. I didn't leave this cube in this state for very long, as I found that it was impossible for me to solve once it was mixed up. I cannot find a picture of it. Next I decided to do something with it that I'm pretty sure hasn't been done before. I made it into an "Inverted" cube. Rather than it having colored stickers on a black cube, I have black stickers on a colored cube. Unfortunately, I ran out of black stickers, and had to use purple for the white side, but I've got some stickers on order to replace that and "complete" this cube. It's a nice fun challenge to only be able to partially see the colors of the sides. I really like solving this one.